The Middleton outfit will play their biggest headline show to date joined by The Charlatans, Blossoms and Cabbage. 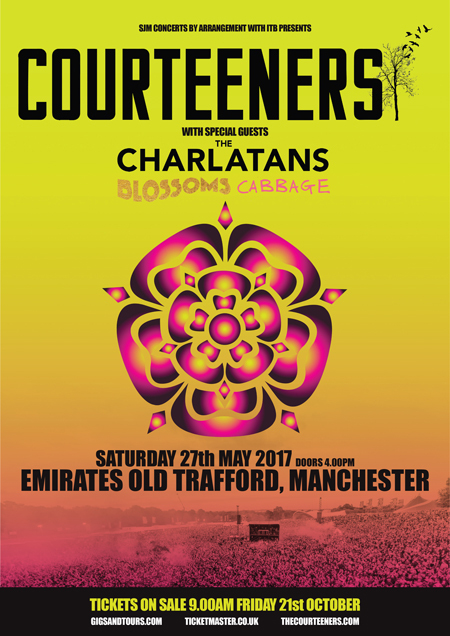 Courteeners have announced a huge Manchester headline date at Emirates Old Trafford next spring. The Not Nineteen Forever outfit are set to play the former Lancashire cricket ground on 27 May 2017, along with a host of special guests. Joining Liam Fray and co. on their biggest headline show to date will be The Charlatans, Blossoms and Cabbage. Tickets go on sale on Friday 21 October from 9am. Meanwhile, the Middleton band are set to release their fifth album, Mapping The Rendezvous, through Ignition Records on 28 October 2016. The record - which features the tracks The 17th, No One Will Replace Us and Kitchen - are available to pre-order now.